Despite the fact that 20 out of the 32 teams in the NFL would kill to replace their current quarterback with Filthy Phil Rivers, having an aging pseudo-Hall of Fame QB puts your franchise in an uncomfortably pressurized situation to win now. Very much like the Cowboys and Giants, this San Diego team feels the clock ticking on their signal caller, however unlike those other teams, they haven’t adequately weaponized their roster to support their star. Personally, I am not sure where the River is ultimately going to end on Phil’s career (my pun game is in mid-season form) but I can’t help but think the Rivers-Gates Chargers will go down as the Malone-Stockton duo of this generation; fun to watch, statistically elite, yet winners of nothing. Ten years ago, the Chargers made the decision to move on from Drew Brees because they thought his rotator cuff was made of Polly-O string cheese, and because they had Rivers ready to go. It’s hard to argue they regret that decision since Rivers has turned out to be an excellent QB, plus we do not know what Brees would have looked like without Sean Payton, but it’s one of the more intriguing “what ifs” of the 21st century in the NFL. Philip Rivers, once a side-arm game manager handing the ball off to LaDainian Tomlinson every play, has come very far in his progression as a passer. He’s at the point now, where if he has a clean pocket, he can absolutely shred you. Despite his statuesque immobility, he has never been one to require all kinds of time. His quick decision-making and short-armed throwing motion have continuously allowed him to make those “phone booth throws” downfield that defy logic. Having said that, when you look at this Chargers offense, the O-line has got to keep Rivers up at night. DJ Fluker is about as bad as you can possibly be as a former 1st round pick at tackle, without being considered a bust. He’s not terrible, he’s just kind of…there. The rest of the line is a who’s who of decent to below average linemen that you’ve only heard of if you took one of them in a Madden Fantasy draft over the past couple years: Joe Barksdale, Jamaican-born Orlando Franklin, and King Dunlap. The line doesn’t need to be great, but in a division with Khalil Mack, DeMarcus Ware, and Von Miller, they need to keep Rivers from picking grass out of his facemask all year. Color me skeptical. The skill positions give much more reason to be excited. San Diego’s offense predictably felt the loss of Keenan Allen when he went down last year, but other guys like Stevie Johnson, and the speedy Dontrelle Inman filled admirably and the Bolts still scored and moved the ball at an above league-average rate. The same cast of characters is back this year with the perpetually underrated Danny Woodhead out of the backfield, Allen, Gates and Inman on the outside, and have also added Travis Benjamin to the WR core to stretch the field. Hopefully for their sake they get far more production from 1st rounder Melvin Gordon than they did in 2015. Gordon is a real X-Factor to me this year. With all of the light, 6-man boxes that San Diego will see due to their potent passing game, they really could use a guy that can rumble for 6 yards between the tackles. Gordon was trash last year, absolutely awful. Many are calling it an awkward marriage of skill sets and schemes, and I do buy some of that, given how different the Wisconsin offense is to anything resembling the NFL. However, when you look at the 2015 tape, you see a plodding Big 10 running back whose volume of carries and offensive line made him look better than he was in college. Considering the melancholy ballads of Ron Dayne and Monte Ball, this wouldn’t be the first time the Wisconsin Badgers inflate an underwhelming tailback’s draft status by feeding him the ball 400 times/year. Overall, I can see this being a top 8 offense if the line holds up and the skill guys stay healthy, but even if they don’t, the floor is still pretty high because of Rivers. As has been the case in previous years, scoring won’t be the issue here. The other side of the ball is normally where the problems lie and 2016 might not be any different. 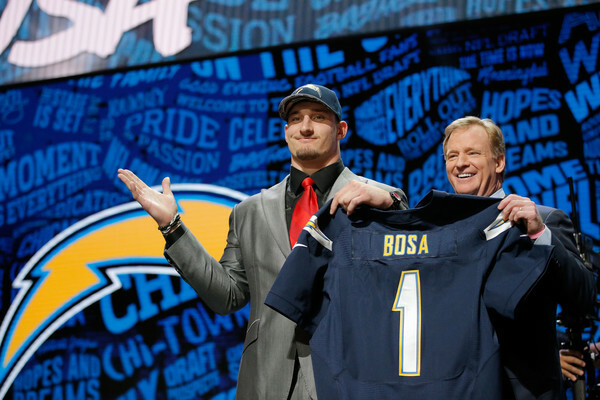 A bold call here… I think Joey Bosa will be an epic, unapologetic bust in the National Football League. Mark my words, he will no longer be on a roster by 2022.I am always weary of D-Linemen in college who dominate without being particularly strong or quick. Judging by his lackluster combine numbers, Bosa did exactly that at Ohio State against future high school gym teachers and used car salesmen…not NFL athletes. The fact that he held out for as long as he did is also unconscionable on his part. In this post 2010 CBA world we live in, rookie contracts are more cookie cutter and standardized than they’ve ever been…how could he, a non-QB draft pick, really complain about? This does not look good for him now in the eyes of Chargers fans, and certainly won’t help him once he hits the free agent market years from now. Primadonnas are not exactly in high demand on most NFL franchises. Other than Bosa, there is not much on this D-Line to write home about. Corey Liuget has certainly had his moments in the NFL as a run stuffer, but at the end of the day he’s only a slightly above average player at his position, and the Chargers 31st DVOA ranking against the run last year proves he needs tons of help. The underrated Brandon Mebane was signed away from the Seahawks this past off-season to provide some of said help against the run, but he will have to play at an extremely high level regardless of how well Bosa plays. The loss of Eric Weddle in the secondary will be felt big time, especially as San Diego weren’t really able to replace him in a meaningful way. 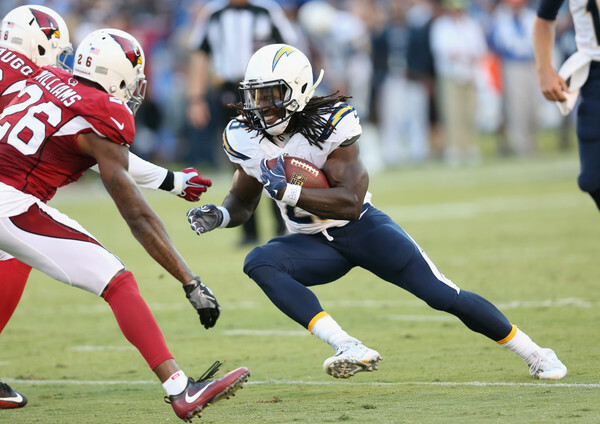 Former practice squad guy Jaleel Addae will step in to play that centerfielder role at the back-end, and that should scare Charger fans. 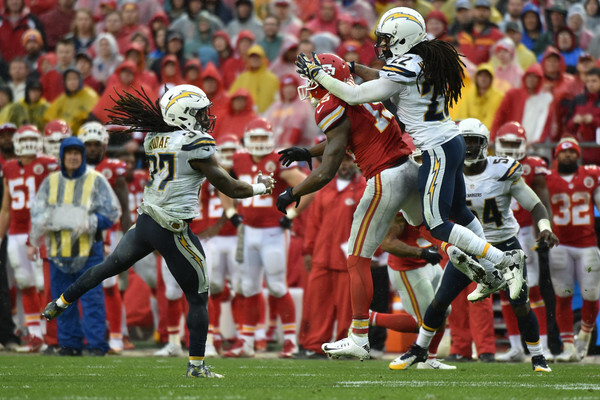 Now here’s the good news: the Chargers have a top 5 under 26 duo at cornerback in Jason Verrett, whom has blossomed since being taken in the 1st round in 2014, as well as incoming free agent Casey Heyward from the Packers. For whatever reason, Heyward’s most infamous snap thus far is that “fail mary” play on that Monday nighter against Seattle with the replacement refs 4 years ago, but he has otherwise very quietly been a B/B+ corner for the Pack since. I like the corners here, I swear I do, but the fact of the matter is that in today’s NFL it doesn’t matter how good your cover guys are if the opposing QB has a full 3 Mississippi to throw the ball. I don’t think the Chargers will be able to synthesize a pass rush out of thin air like Rex Ryan teams do, for instance. Ultimately I would be shocked if this unit finishes in the top 20. 7-9. Sorry Charger fans, but in a division with the SB champs, the annoyingly good if not unspectacular KC Chiefs and the up and coming Raiders, someone is going to have to finish last. Its going to be the Bolts. They simply do not have enough on defense to keep teams from hanging 30 on them consistently. Rivers is good, but he’s not Brady. The man needs help. This team isn’t bad by any means but they aren’t complete. Side note: That 7 win prediction QUICKLY morphs into 3-4 wins if anything, and I do mean anything, happens to Rivers.